For several days I have been hearing in my mind that old hymn, "Great is Thy Faithfulness." I just haven't been able to get it out of my mind. Now, I'm not musical AT ALL! I definitely fall in the category of "make a joyful NOISE!" Thank goodness someone else was "singing" the song in my mind because if it had been me I might not have recognized the tune! Admittedly, it has a somewhat draggy tune--not peppy at all; but the words do have a message. I just couldn't get away from it. These verses are just the reminder and encouragement I have been needing the last few days. How wonderful that we have hope because His mercy and compassion never fail. In fact, we start each day with a fresh abundance of his tender mercies--we will never be without His loving stability. His merciful love is ours. He is our portion--our destiny. All we have to do is trust, expect, and wait for His answers. Great is Thy faithfulness , Lord, unto me! I'm still working on the direction or focus of my blog. I have always been the kind of person who needs to jump in and then figure out all the rules, procedures, fine points, etc. So, as I stumble along doing my own thing, I am discovering lots of interesting things about the blogging world. One concept that I am constantly aware of and exploring is the manner in which others organize their writing and the presentation of their blogs. I have found lots of good ideas out there that I intend to use to help me continue to develop my own little corner of blogland. I have not completely decided what I think of memes and other lists/games that are passed around/tagged on blogs. I have never been a great fan of chain letters and these are so similar; however I see some that are fun or interesting. I like Thursday Thirteen and have participated a couple of times. I also enjoy Wordless Wednesday that some people have shared. I guess it is more the subject or purpose that makes the difference for me rather than the fact that it is meme/game/list/whatever. Anyway, I needed to do something light hearted today. My blog has been serious for a couple of days and I have had serious decisions to deal with in real life also--I need a mind break--So here goes! I found this at Susan's Penless Writer. Thought I'd give it a try 'cause I do love word puzzles and games! Feel free to use it and pass it along. • Use the the first letter of your name to answer each of the following. • Answers must be REAL places, persons, things. . .NOTHING MADE UP! • If you can't think of anything, skip it. • Try to use different answers if the person before you had the same initial. • DO NOT use your name for the boy/girl name question. • DO NOT use a search engine to look up answers! 4. Street name: Mulhollan Dr.
22. Things You Shout: MOVE THAT BUS! In remembering the events of the past week I came up with several thoughts that I might share. But, when it came to writing, I just felt led to share a discovery my husband and I have made that has become important in our lives. You might want to also visit the place we "go" on Sunday mornings. We don't attend church anymore! WAIT! Before you assume we have turned our backs on our beliefs and lifetime habits, let me hasten to explain. Because of my husband's illness, and the fact that he is dependent on a ventilator for breathing, we are not able to attend church together. I occasionally go, when we work out arrangements for someone else to stay with Mr. L. We stay connected to events and happenings at the church through the email newsletter, friends, and our son and dil. Our dil is currently on staff at the church we have attended for over twenty-five years. We still have a church home--we just aren't there often. We have had to be rather creative in satisfying our habit of having Sunday morning worship. Certainly we realize that we can study the Bible, pray, and worship by ourselves anytime. It does not have to be in a church building on Sunday morning. However, when you have "gone to church" on Sunday morning for your whole life it is difficult to give up that time with other believers. So we looked for alternatives. We knew that there were multitudes of preachers on the internet and TV. Mr. L definitely understood the impact of video on delivering The Word to masses of people. After all, he had enjoyed a thirty-five year career that was based on the production of Christian video and print products. We had both used video and audio Bible study helps--in groups at church and by ourselves at home. But receiving our weekly Sunday morning worship message through TV on a regular basis was a new experience. We tried several possibilities before finding some we enjoyed and felt comfortable spending time with. One of the first we found was a local minister from a denomination different from ours. We still enjoy watching him from time to time. We don't agree theologically on every point he makes, but we do respect his obvious commitment and dedication to serving the Lord. We also worship occasionally with a church in another city. The well-loved pastor of this church went home to be with the Lord several years ago, but they still use tapes of his preaching in the program we watch. Seeing and hearing him preach is like a walk down memory lane because my husband had the privilege of working with this dignified man of God at one time. As you might imagine, these services are somewhat dated. Of course the message retains its relevancy! However, we are sometimes amused by the clothing styles we see in the congregation and indulge in a guessing game of what year we are watching. Yes, you can talk and play guessing games when you are in worship service at home! As much as we enjoyed these worship services and messages, we still were not satisfied with our Sunday morning "going to church" experience--Until we found our TV at-home pastor. This man does not know us, we will probably never meet in this world, but he blesses us every week. We watched him on TV for some time and then his time slot changed from Sunday morning to some time later in the week. Which, when you think about it, is probably a better time to reach unchurched people or non-belivers. They might not be looking for a Sunday morning sermon like we are, but might find a Friday night program while clicking the remote. At any rate, we have recently started using the website to get our Sunday morning message. If you want to hear a Good Word, or you find yourself in a situation similar to ours where you need an TV at-home pastor, we heartily recommend you find Bill Purvis from Cascade Hills Church in Columbus GA. He always has a good message, is a down-to-earth, practical, and committed follower of the Lord. We enjoy and appreciate his delivery and understanding of The Word. You can find him on the web here at www.cascadehills.com. Is there anyone more exuberant that a three year old celebrating her birthday! Yesterday E Girl--our only princess grandchild--had her "frens" with her as she celebrated. She is always a happy child, but yesterday she was excited beyond belief. She had been talking for weeks about her party. She told me innumerable times, "all my frens are comin' and it's gonna be a Doha pahty!" This picture shows E Girl in a special dress for her Dora-themed party. The dress has a history. Several little girls in her circle of friends have had Dora parties for their third birthday. The dress has been passed from child to child to wear on the big day. On the front of it there is a birthday cake with three candles and the skirt is full of images of Dora. These girls have a head start on the concept of The Sisterhood of the Traveling Pants! Grandchildren! What a joy! We got to have two of ours with us last night while their parents attended a banquet. They both had activities with friends before coming to our house so they had a full social calendar for the evening. Three-year-old E went to visit a friend's dance class and six-year-old L had soccer practice. When they were brought to me they were hungry. They had both eaten earlier, but they were HUNGRY! I know how to feed children nutritionally, but, after all, I am the Grandmama! So, last night I think I probably failed Grandparenting 101. My attitude was pretty much--Go for it! • POPCORN--We love our popcorn! It is even better when we eat it in our tent. Our tent is under the kitchen table with a couple of sheets thrown over it to hang down and "hide" us. It is very cozy--especially when we bring books to read. Sometimes we stay there until Mama comes to get little people! Last night we didn't take time to build a tent--We just devoured the popcorn because they were so hungry! • CHOCOLATE MILK and ICED TEA--E had "chocky" milk and L had iced tea. I know, I know. It was too close to bedtime for liquids, but--they were hungry! • RAISINS--E loves them; L, not so much. He turned down all offers of fruit. He was hungry--just not for anything too nutritional! • COOKIES--E found some cookies in the pantry that Poppy had gotten in a gift basket. These are BIG cookie "sandwiches" with strawberry filling between two--sort of like an Oreo, but not chocolate and bigger. I just knew she would take one bite and throw it away. She.ate.every.morsel--after she licked every bite of the icing off both cookies. • POPTART--L saw E with her monster cookie and he needed one. Of course, he doesn't like strawberry and the only other cookie in the house was of the oatmeal raisin variety--Remember, no raisins! So he found a Poptart--with chocolate. While we were on this feeding frenzy we played Trouble and Chutes and Ladders. At least, L and I did. He has become fairly patient with E as she learns to play games. He knows she will get tired, leave her game pieces where they are, and go to another activity. Sure enough, she went to find a her doll and a bear. Then L got competitive--He beat me at both games. All evening we took breaks from eating/playing games to check on Poppy. The children like to be the ones to go ask Poppy if he is OK. E loves to run to the bedroom and ask, "Poppy you "tay? You need gamama?" and then back to me to announce the answer. When E started talking about her pink bear at home I knew she getting sleepy. She got a doll, a bear, a blanket and had L and me curl up with her on the couch. We watched Nemo until Mom came for the little ones. What a precious time. Yes, I think failed Grandparenting 101 last night! I usually try to keep things pretty calm and remember the "rules". For these two, we are the closest grandparents and it would be easy to go overboard. Last night I acted like a grandparent that only sees them once a year--You want it? You got it! I reminded myself of my own Dad. He didn't see the children often because of distance. I could say, "You have had enough cinnamon rolls/candy/brownies/etc. Don't eat anymore." Dad would be slipping them another one under the table! Grandparents! Gotta love us. My children will be glad to let their children come back anytime because they know I will always pass with flying colors in the "loving them" category--And, of course, nothing says lovin' like a little junk food! Mr. L (also known as ph--precious husband) and I have had opportunity many times in the last two years to be on the receiving end of deeds of kindness. For that, and so many other things, we are very grateful. We thank God for friends! This weekend I was having somewhat of a pity party. You know the kind--"Not an all out boo! hoo! Woe is me! Everybody leave me alone while I complain and cry!' --embarassing public pity party. But, a "I'm tired and feeling down" little private party. I was the hostess and only guest! I was just feeling a little sorry for myself and just a bit lonely! How wrong! I knew all along that I was wrong, but I had the visible evidence of that this morning! Thank you, Lord--and friends--for that display of caring this morning. I went to the mailbox today to get the usual load of catalogs and bills. And there--the evidence of friends thinking of us! Five--count'em, 5--cards expressing concern, love and caring for Mr. L and me. In addition to the cards, we received several friendly emails today. Those were mainly in response to Mr. L emailing some friends about my blogging endeavor. I guess he thought I needed help rounding up some readers. That was not a part of my pity party--I may get to that point, but I'm not there now! S--First she was my friend, but also loves Mr. L. Her card was to him--funny with a handwritten note that showed so much concern for his well being. She and I have been friends for about 30 years. We are the kind of friends who may not see each other for two years and can take up the conversation as if we haven't taken a breath. T--A business friend of L. I have met her maybe two times--the last time when we met for lunch in Chicago two years ago. The card was addressed to our family. D--A church prayer team card written and signed as she took her place in the prayer room to pray for us and others. She has been a friend for many years--our children grew up together in our church. R--A relatively new friend who wrote me a note to just say she loves us. We didn't know R until last year and now she is special in our lives. A group--A card signed by several friends who work together. Precious Godly people! Such a variety of people. People from three different states. People who have never met and have no connection to one another in our lives. Let me hasten to add that from the beginning of Lee's critical illness two years ago we have been covered up with prayers and love. We receive cards, notes, letters, emails, gifts, and visits on a regular basis. We know there are people who remember us daily in prayer and conversation. We appreciate all of that more than we can ever express! It's just that there was such a display of love on a day when I really needed to be lifted up. I know it was an answer to my little pity party! Let me also say that I am aware of the pain several people in the blogging world are experiencing right now. Even though I have read Heather's blog and admired her design work, I do not know her or Kelli--even in the blogging sense of knowing someone. My pitifullness this weekend was not even one small fraction of a fraction of what those two ladies, and others that some of you know, are going through. I am very aware of that! All of this has made me think about my own response to people who are hurting, lonely, or experiencing a bad day. I'm pretty good at listening to a friend who is hurting. I have friends that call me when they need compassion. I listened and advised people for years in my office at school--many teachers knew they could vent to me about problems. But, the unanticipated acts of kindness have never been my strength. Now, in this season of my life when I am at home most of the time, it is difficult to do things like visit or cook a meal for someone. I also don't have the time to give to organing an undertaking such as Boomama and other friends are doing for Heather and others like her. But, I know I can do more--more of the little acts of kindness for the people I know in real life--and maybe in the blogging world when the time is right. So, today's musings about unneeded pity parties and acts of kindness have led me to a small personal commitment. I'm going to share it here in order to impose a little accountability on myself. I commit to remembering people more often. This means I will get my self organized (writing/postage supplies, etc.) and write and send notes of encouragement, concern, and care to friends on a regular basis. I am talking about the unexpected contact when I am aware of a need--the follow up to the more obvious incidents. You are welcome to check with me later to see if I have kept the promise! Thanks, Tammy, for my first blogging meme. I enjoyed reflecting on the events and emotions of that very special day. It seems like a million years ago! It seems like yesterday! His version or mine? We really met when a group of singles at our church went out after church on a Sunday night. The whole story is here. We met in early March in 1968, so we have known each other 39 years and counting. Our first date was on April 6, 1968. We went to the movie, Guess Who's Coming to Dinner? 10 months--We got engaged on Valentine's Day in 1969. He has sent me flowers every Valentine's Day since then to celebrate what he calls the "monthaversary" of our engagement. The card always mentions how many months since we got engaged. We celebrate thirty-eight years this year. A three-tiered almond flavored white cake with all white icing decorated with white icing roses on the top layer. We did not have a dinner reception. We had fairly simple refreshments. We were paying for most of the festivities ourselves. I was finishing my second year of teaching and he was a seminary student. We weren't exactly making big bucks! We did have a rehearsal dinner the night before. Even though I helped plan it, I could not tell you a thing we ate. I was too concerned that his family and mine enjoy themselves and get to know each other just a little bit! We each had one attendant. My step sister was my bridesmaid. We still love each other! His best man was a good friend with whom we have unfortunately lost contact. We still have long distance contact with some, but not all, of the others who participated--like ushers and people who served at the reception. No--Neither of us cried--We did shake a little! When I started down the aisle with my Dad and saw my husband-to-be waiting at the other end. Some moments are funnier when they happen to you--sort of , "you had to be there and be me to understand." b. When we left the church several cars of friends were following us--honking and carrying on. Several of the guys had been telling my husband that they were going to follow us to where we were spending the night (They didn't know where we were going) We stopped at a traffic light about a mile from the church. We were in the left lane and a car full of people we did not know was in the right lane at the light. The man driving motioned for us to turn in front of him when the light changed--thereby escaping all the people following us. We did--and realized we were turning into the zoo! We found a detour through the zoo and didn't see our friends again for several days! c. You know, I remember laughing at the reception, but I couldn't tell you what was funny or much of what was said in conversation with people. It just went by in a blur! No--It all went surprisingly well. Remember the teacher/seminary student budget? We went thirty miles down the highway to Dallas! The seminary student had to be at class on Tuesday--So we had two days. However, we considered the whole summer our honeymoon. We sublet a student apartment for the summer and he finished school just three weeks after our wedding. We moved to another apartment when school started over in August and went back to "real life." Given the circumstances of time and distance between families there is nothing I would change about what we planned. I do wish the families had had more time together. For most of our marriage I have slept on the left side of the bed. I imagine my answer is different from what most people say--and it's not really about the bed. We have had beds of all sizes full, queen, and king--and the last one we bought was a king size one that adjusts to different positions. He liked it--me, not so much. Now we closely share almost every moment of our lives; but when we sleep he is in a hospital bed and I am nearby in a single/day bed. I'm going to put an ADDENDUM at the end of the meme to tell a little more about our unique story. I plan to write about our remarkable journey. I will give a little preview of the story now. Patience--But we have both REALLY improved on this in the last two years! He does, but he makes sure I know what he has done. 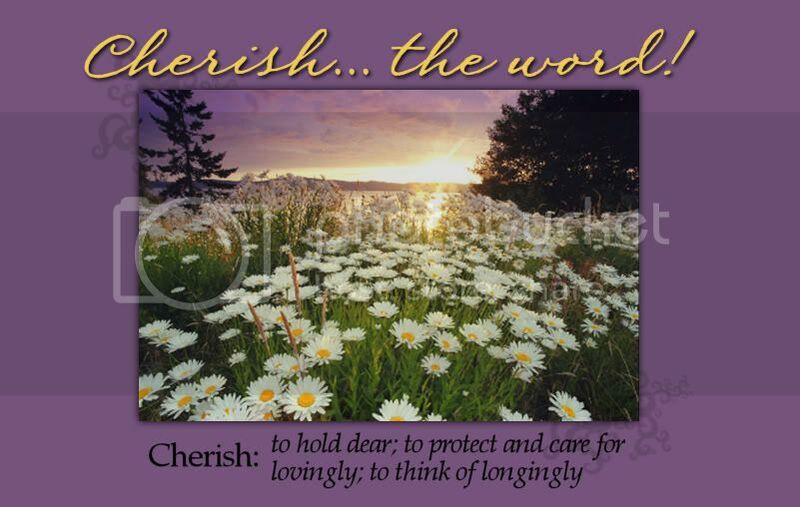 "Cherish Is The Word"--The Associations version--That's how my blog got it's name! At a Baptist wedding in Texas--with the reception at the church--to a SEMINARY STUDENT--in 1969--with all of my conservative daughters-of- a-Baptist-preacher paternal aunts in attendance???? Come on now! The closest thing to dancing was the pianist who played "show tunes" throughout the reception. It had an empire waist with a lightly beaded lace bodice and long full lace sleeves that had long cuffs with little covered buttons. My veil, made by my an aunt, was long with several layers of tulle pulled together into a flat bow made from the same material as the dress. The dress was long without a train and the veil formed a short chapel length train. It was simple, but exactly what I wanted. My dress was made by the very talented mother of a high school friend. I showed her a picture from a magazine and she made the dress exactly like the picture. Mostly white roses with yellow and white daisies. 30 Are your wedding bands engraved? My husband's is engraved with our names and the date. Addendum-- A brief glimpse at the last two years of our lives. There is much more to be told. Two years ago our lives changed. We have always been on a remarkable journey together, but we had no idea how much life could change. Lee became very ill in the summer of 2005 and after four days in intensive care suffered respiratory failure. He was entubated and later placed on a ventilator. After almost three months in the hospital and rehab, it was determined that he would not be able to be weaned from the ventilator as the doctors had hoped. Over the next months he retired from his career in religious publishing and I took an extended leave from my position as an elementary school principal. I later also retired. In the last two years we have learned more than we ever thought we wanted to know about health care, ventilators, feeding tubes and perseverance in the time of trouble. We have also learned more than we thought possible about God's care and grace, the love of family and friends, and the importance of life and living in God's will. We still do not understand this part of our life's journey, but we know without a doubt that God is with us and will continue to guide our paths and decisions if we depend on Him. My husband is a remarkable man who continues to seek God's will, work for the Kingdom, and be a blessing and inspiration to all who know him. I'll tell the rest of the story in a post soon. I'm new to blogging and don't quite understand the meme tagging ettiquette. Whoever has a wedding story to share is welcome to try this meme. Enjoy! Easter Sunday! Where is Spring? Not here in cold Tennessee! The prediction is for this to be perhaps the coldest Easter Sunday on record. Guess some of those Easter frocks will wait until next Sunday to be worn--or they will be covered up by warm coats. I'm looking forward to church today. I don't go on a regular basis these days. My husband has been battling a serious illness for a long time. He is now dependent on a ventilator and not able to get out (I'l be telling that remarkable story soon). Because of that we normally worship each Sunday with a couple of favorite preachers on TV. However, because our church is using a different schedule today, my son and I will be able to share caregiver duties and both of us make it to church. I have "graciously" allowed him to attend the 7:30 service and I will go to the 9:30 one. One grandchild is going to church with daddy and one will be in her preschool class and come home with me. After my daughter-in-law completes her responsibilities for the 11:00 service (she is on the church staff) she will join us for Sunday dinner. We have planned a somewhat unusual Easter dinner. I'm not cooking and I'm sure my dil doesn't want to after a very full weekend of church responsibilities. We have some truly thoughtful friends who sent us a gift of dinner from Famous Dave's for the whole family. They know how my husband loves bar-b-que! I will make one cooking concession. My sons always request my deviled eggs for holiday meals. So, I will contribute a few eggs to the meal. Everything else is coming from the restaurant!